With the advent of Spring, Easter and Passover, I decided to create a herd of marshmallow sheep. These little guys are such a blast to create. As it always does, it took a little bit to figure out the right materials and the best way to assemble each part. So where did this inspiration come from? That’s simple. It’s all the cute Easter and Passover stuff you see in the stores. 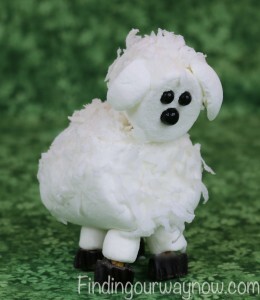 These Marshmallow Sheep can provide a great centerpiece for a family meal or gathering. 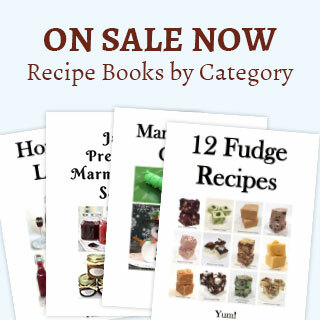 If you can part with them, give one to each of your guests to take home. Sheet pan lined with parchment. Simple Icing: Mix a cup of confectioner’s sugar with a teaspoon of water in a small bowl. Add water a little bit at a time until you have the consistency of a thick glue. Set aside. Marshmallow Sheep, Tail, and Ears: With your kitchen scissors, cut off three small wedges from the edge of a regular marshmallow. Marshmallow Sheep Legs: Cut 4 pretzel sticks in half. Cut four small disk shapes off the licorice vine. Gently push a mini marshmallow on the pretzel stick until a bit of the pretzel is showing on one end. Push a toothpick in the center of the licorice disk to create a hole for the pretzel stick. Gently push the pretzel stick with the marshmallow into the licorice disk. Marshmallow Sheep Head: Place the regular Marshmallow on the board face side up. Push a toothpick and in and out of the marshmallow where the two eyes will go. Push a toothpick and pull out several times where the nose will go. Gently press in the small black candy pearls in the holes for the eyes. Now firmly press the larger black candy pearl ball in the hole for the nose. At the bottom of the head, push the toothpick and pull out to create a hole and gently push in a half of a pretzel stick half-way in. Firmly press the earpieces on each side of the head near the top. Note: The place where the marshmallow is cut is very sticky so it should adhere easily. Marshmallow Sheep Body: Place the Jumbo Marshmallow on the board to find the flat side. On the top, not too far from the edge, push the toothpick in and out to create a hole where the head will go. Turn the marshmallow over and create four holes with a toothpick for the legs. Be careful not to put the head and leg holes too far near the edge or the outside of the body. 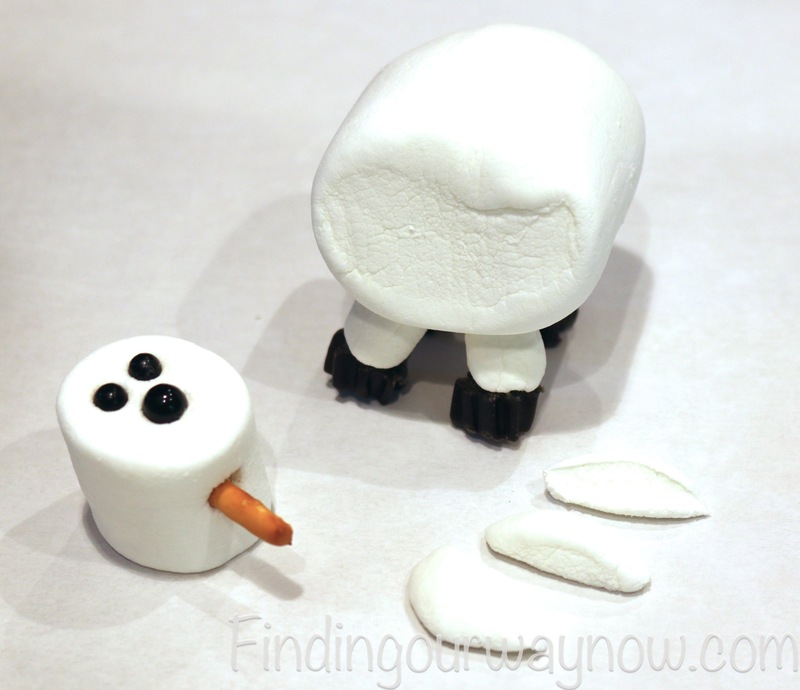 Marshmallow Sheep Assembly: Gently insert the pretzel stick end of each leg into the holes you created for the legs. Stand the sheep up right at this point and gently press the tailpiece in place. Note: The place where the marshmallow is cut is very sticky so it should adhere easily. Stir the icing to ensure consistency. Brush the icing on the top and sides of the body, then sprinkle the iced area with coconut. Pat gently to help the coconut to adhere to the body. Find the hole for the head with a toothpick. Holding the body from the underbelly gently push the pretzel end of the head into the body until the head is connected. Final Step: With the sheep now standing upright on the sheet pan, dab a bit of the icing with a pastry brush on the top of the sheep’s head. Sprinkle with coconut, patting gently to help it to adhere to the head. Notes: It’s important to follow each step in the order presented. It makes this fun project go much more smoothly. I use pretzel sticks as connectors so that the whole thing is editable and for the safety of little children. I like using a sheet pan for easier cleanup. I know you’ve seen some of my other Marshmallow Creators before, so I know what you’re thinking, but they sound so complicated. They aren’t as long as you follow each step in the order they are presented. 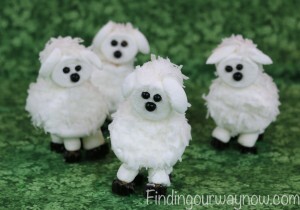 These Marshmallow Sheep can be a great project to do with your kids or grandkids, or by yourself just for fun. So, as I said before in my other Marshmallow Creator projects, make your list, get thee to the store and have some fun. If you enjoyed these Marshmallow Sheep, check out some of my others such as the Marshmallow Bunnies, Marshmallow Reindeer, Marshmallow Snowmen, and Gift Idea Recipes From The Kitchen.